A lot of what roasters do is done alone. 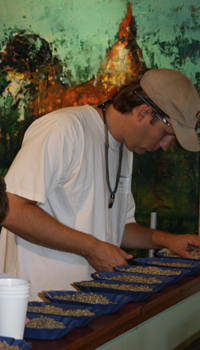 Aside from our time at the farmer's market, everything else… roasting, cupping, packaging… is a solitary affair. That's why we take advantage of every opportunity to see what the rest of the specialty coffee roasting world is up to. To that end, we traveled up to Lyme, CT to attend the annual Northeast Regional Roaster's Retreat. Held on the grounds of the beautiful Ashlawn Farm, we had the pleasure of sharing company with some of the most passionate coffee people we've ever met. In attendance were wide-eyed people just starting out and experienced veterans, eager to share their knowledge (and learn a few new tricks). Terry Davis, owner of Ambex Roasters, a roasting equipment manufacturer, demonstrated how different batches of the same coffee can taste dramatically different just by altering the time/temperature profile of the roast. As you might imagine, tasting, or as we say, "cupping" coffee is a large part of what we do as roasters. Taste is a very subjective thing, and the more elements that can be standardized, the more consistent the end result will be. We participated in an sensory exercise with a special kit of scents called "Le Nez du Café." The kit serves as a reference standard of the significant aromas that are found in coffee and consists of 36 vials of scents commonly associated with coffee such as tobacco and chocolate as well as less common scents (basmati rice anyone?). Sometimes when cupping coffee, I'm at a loss for words to describe a taste. Exercises like this give me an aromatic glossary to refer back to. Saturday night, Ashlawn Farm held a cookout that featured organic beef raised literally yards from where we stood. It may have been a result of the sensory exercise earlier in the day or maybe just my imagination, but I swore that I could taste the grass in the beef. Whatever the case, it was the perfect meal to end the day. Apart from honing our technical skills, the shared camaraderie is what makes these types of events really special. Swapping tips and trading "war stories" over a beer helps create a synergy that just isn't possible on internet bulletin boards. All in all, a weekend well spent.